Mike’s Custom Flooring has a dedicated staff that is experienced and ready to handle any hardwood flooring job you need done. We serve all residential and commercial customers in the Eastern Panhandle of Berkeley and Jefferson Counties in WV as well as Frederick, Loudoun and Fairfax Counties in VA.
Real hardwood floors; when they are done right, are a great addition to any home or office. Hardwood floors need some work to keep them looking their best and we have technicians that are trained and have many years of experience in sanding, refinishing, staining and installing custom hardwood floors. We are proud of our work and always leave the job with our customers satisfied. We pride ourselves on the quality of work and craftsmanship that we offer as well as the customer service and follow up that we are known for. Mike’s Custom Flooring offers many quality services including hardwood floor installation, stair tread and risers, border work, hardwood floor water damage repair, dust containment refinishing and custom color stains. Nailed Down Hardwood Flooring: This is a technique that can be used to install your hardwood floors and as the name entails nails are used to set the planks of wood down and secure them to a solid flooring underneath. Your existing floor will have to be inspected when deciding if this is the right floor installations option for you. 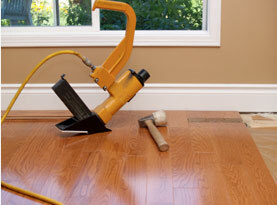 Glue Down Hardwood Flooring: This is a technique that is used when installing your hardwood to a concrete or plywood subfloor. This method will also require a layer of cork or other material as an underlay. 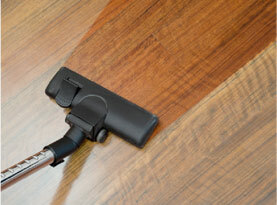 Floating Hardwood Floors: This is a great method that does not use glue or nails to attach it to the subfloor. The flooring is attached to each other and the weight is enough to keep it all down in place. This method is ideal when you live in a place that has many different climates and changed in weather. It allows that floors to expand and contract without causing ripples, bunching or damage to the wood itself. 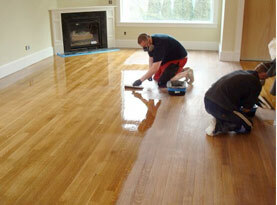 If you are in need of having your hardwood floors refinished then you have come to the right place. The most inconvenient and concerning part about the refinishing process is the amount of dust that is blown around your home as the floors need to be stripped down and sanded down to the bare floors. 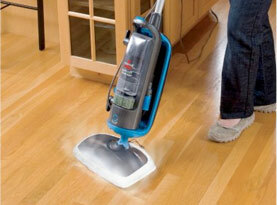 This can create a huge mess, but not when Mike’s Custom Flooring is on the job. 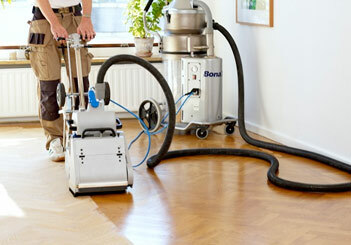 We have state of the art dust collecting equipment that can keep the dust and mess under control. Call Mike’s Custom Flooring if you want the best quality with the least amount of mess when installing or refinishing your hardwood floors. © 2016 Mike's Custom Flooring. All rights reserved.